Want to know all about how to choose the best odor resistant dog beds? You’re in luck, because we’re going to cover everything you need to know about it! Owning a dog comes with many wonderful benefits…but it also comes with a few drawbacks, including odor issues. If you choose right, though, his bed doesn’t have to be a source of stinkiness! Read on for our complete guide to choosing the best odor resistant dog beds! Why do you need an odor-resistant dog bed? As I mentioned above, stinky odors are probably one of the top three downsides of dog parenting. Even dogs that live almost exclusively indoors will find some way of attracting odors. And then that smell gets stuck on your dog’s bed. Obviously, taking a good care of your pooch and his hygiene can be very helpful in this respect. Bathing your dog with a shampoo once a week is safe, but you can’t really bathe your dog every single day. That is why it is important to choose a great bed for your dog that is odor resistant. When I was shopping for my dog bed, I wanted to make sure that I knew exactly what I wanted. So, let’s take a look at things you should consider when you purchase an odor-resistant dog bed. The first thing to consider is the size of the bed. The size of the bed that you want to buy depends on the size of your dog. However, it also depends on how your dog likes to sleep and how much room you have for a bed. For example, if you have a dog that is small breed but likes to sleep sprawled out, you should go with at least a medium-sized bed. Related: What is the best dog bed for dogs with arthritis? Check out this guide to dog bed sizes, but keep in mind that they can vary slightly depending on manufacturer. If you’ve spent hours decorating your home just so, the last thing you want is a big, ugly dog bed sitting in the middle of the room and clashing with your design! Choose style and color that fits the overall décor of your home. Of course, this might not be as important for you if you plan to use the bed outdoors, but it definitely is a significant feature to consider for indoor beds. One thing I hate about most dog beds is the fact that not much effort goes into their appearance. I will say this, though: it’s better to choose a really great yet less-attractive bed than to buy something subpar that matches your decor. You can always add a colorful blanket or slip cover to get the look you want. Good material is important for any bed, but it’s particularly vital when you’re choosing the best odor resistant dog beds. After all, it’s the material that makes or breaks the bed’s ability to resist stinky smells. Think about both inner and outer material when you choose a dog bed. The inner material is important because it is what makes the bed comfortable. Usually, the best choices for the inner material are memory foam, cotton or polyfill. Best outer or external materials, used to make linens and covers for dog beds, include polyester, microfiber, suede and faux fur. When you look for the best dog bed, you need to consider your specific situation and go for the features that you need. For example, if your dog is prone to having accidents, then you should consider waterproof beds. One of such features is also being odor resistant. Also, I’ve always wanted a bed for my pooch that he can’t move around, which is why I choose beds with non-slip bottom. It is important to look for beds that are easy to clean. That means that they are machine washable, or at least have a removable cover that is machine washable. Elevated beds that can be just hosed down to clean are also a good choice. Price is often the best indicator of the quality of a dog bed, but that doesn’t have to be the case always. Also, you need to consider your budget and choose according to it. Don’t worry, there are plenty of affordable options out there. 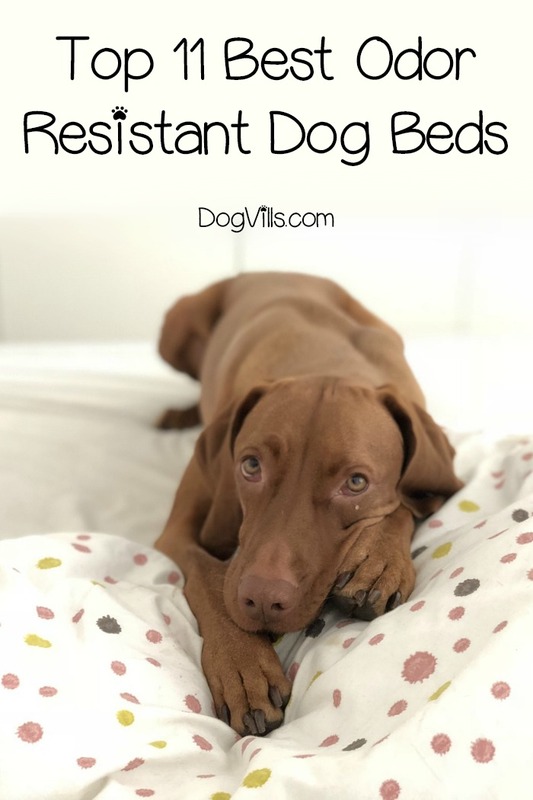 Before I go on to discuss the best odor resistant dog beds, I want to give you a few tips on how you can keep your dog’s bed free of unpleasant odors, especially if the bed is not odor resistant. The first thing you have to do is wash the bed. Check out this video, or read on for a step-by-step process. Start with the cover, if you can remove it and wash in on a normal cycle. Now, the rest of the process will depend on the material inside since you have to wash the bed. Beds filled with foam are the easiest to wash. Put your dog’s bed in a bathtub and fill it with hot water. Add a bit of mild laundry detergent and a tablespoon or two of vinegar. You can even use more vinegar if the odor is very strong. Vinegar is a great cleaning agent, in addition to being able to destroy strong odors. Soak the bed and let it stay that way for 10 minutes. Rinse the soap away and drain the soapy water. Don’t get the bed out just yet. Refill the tub with clean and warm water and rinse the remaining soap. After this, dry the bed thoroughly. To keep the odors away in the future, use a mixture of water and vinegar. 50/50 mixture will do the trick. Spray your dog’s bed regularly, preferably on a daily basis. I find this very helpful in keeping odors away in my home and not just with dog beds. You can also use make this wonderful DIY coat freshening spray on your dog’s beds as well as his coat. Now you know how to choose a dog bed and how to keep unpleasant odors away, so let’s take a look at some of the best odor resistant dog beds on the market. Let’s start with a quick look at all of the beds, then we’ll get into a more detailed overview of each one. I will start with the best orthopedic dog beds, which are usually filled with memory foam to provide extra comfort and support for dogs suffering from arthritis or other bone and muscle problems. I guess if memory foam is good enough for NASA, it is good enough for your dog as well. This orthopedic bed is handmade in the USA, which guarantees the quality of the product. When I shop for a bed, I make sure to choose those made in the USA. Since it is orthopedic and filled with memory foam, this Dogbed4less Dog Bed is very comfortable. It is a good choice for older dogs and dogs with health issues related to bones, joints and muscles. This bed has a very breathable and waterproof internal cover that protects the stuffing. It also comes with a sturdy ballistic nylon external cover, which is machine washable. You can choose between many colors for the external cover. You can also choose between 6 different sizes of this bed. The external cover is very, very durable. It is resistant to light chewing, scratching, hair, dirt, water and odors. This pillow bed is very classic and not that stylish, however. Some dogs might also find that it difficult to get on the bed and stay on it since it can feel overstuffed for them. One of the best orthopedic beds on the market, Underdog Orthopedic Dog Bed isn’t filled with memory foam. Instead, this amazingly supportive and comfortable dog bed uses a system of air cells to evenly distribute your dog’s weight across the bed. Hospitals also often use this type of technology for their beds. With the mattress, you will also get a durable, machine washable cover. This cover is also able to resist stains, odors and liquid since it is made of an anti-microbial material called Crypton. This bed comes in three different colors – mocha, fathom and green tea. It is also available in four different sizes, which means it is suitable for any dog. Handmade in the USA, this bed is made of high-quality materials. However, the quality is also reflected in the price. It is one of the most expensive beds you can find on the market. In addition to this, it isn’t very stylish as well. It has a basic pillow design, which is pretty ordinary. Of course, it won’t disrupt your interior in any sense, but it won’t contribute to it either. I think this is more than enough for dog beds, at least in my experience. This is a pad, yet it feels more like a real dog bed instead. Pet Therapeutics TheraCool Cooling Pad uses charcoal-infused technology that allows the pad to absorb odors. However, this technology is also the reason behind the cooling effect of this pad. This technology helps the pad to dissipate excess heat from your dog. In addition to this cooling effect, this pad also comes with two extra foam layers that provide your dog with maximum support, which is why it is also therapeutic for your pooch. The pad also comes with a washable cover that is also tear resistant. You can easily spot clean the pad and dry it with a towel. Unfortunately, this pad comes in only one size, 36″ x 23″. It also only comes in one color. Additionally, this pad is not very stylish and might look awkward in your living room. However, you can use this pad in crates or kennels, as well as outdoors. This is another bed from Dogbed4less that made my list, and it is very similar to the previous entry. However, there are also many differences. 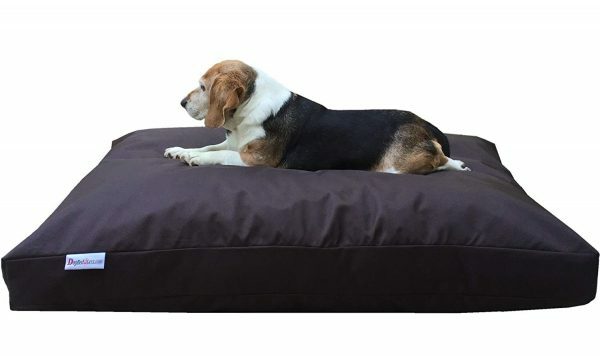 Dogbed4less Premium Orthopedic Memory Foam Dog Bed comes with a heavy-duty ballistic cover (you can choose either seal brown or navy blue), a waterproof internal zippered cover and a solid 4-inches gel memory foam pad you can insert. You also get a bonus external cover made of Suede, which i personally love a lot. This bonus cover has a non-slip bottom as well. Although you can only choose from the two mentioned colors, you can choose one of many sizes. 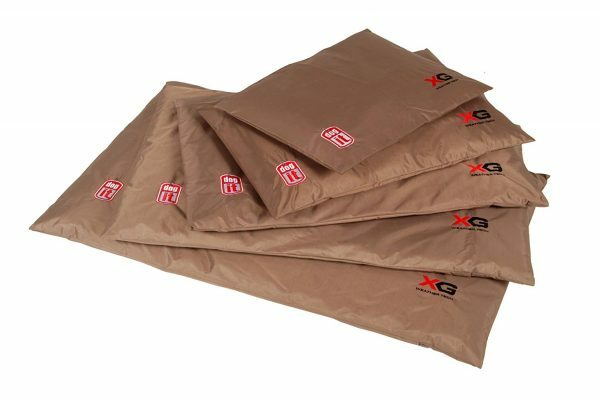 The heavy duty cover is resistant to odors, but also to water, hair and dirt. You can easily wipe it down or wash it in your machine. The memory foam is denser and heavier than with most beds in order to provide comfort and support that your pooch deserves. But, once again, don’t expect anything spectacular when it comes to style since this is basically a simple mattress. Waterproof dog beds are a very useful commodity, especially if you have an older dog who suffers from incontinence or a puppy that is still prone to accidents. Of course, urinary incontinence is treatable in some dogs, so take your pooch to the vet if you haven’t done it yet. When you combine the water and odor resistance, you get a bed that is surely going to last a long time. The Dogit X-Gear Weather Tech Pet Bed is a very comfortable and practical bed. It is filled with polystyrene beads, which is a material that can help improve circulation in dogs. Also, it provides great support because it can contour to your dog’s body. The liner of the bed is made of durable nylon. This makes it suitable for both indoor and outdoor use and perfect for all weather conditions. This liner is also waterproof and treated with a unique coating that makes it resistant to odors and dirt. This bed comes in three basic sizes and three different colors. I also like the style of this bed very much. It is a lot similar to a bean bag, although it can be as noisy as a bean bag as well. This bed is very well priced. It isn’t cheap, but it isn’t very expensive either. This is another bed you can use both outdoors and indoors. Slumber Pet Toughstructable Bed is made of thick polyfill cushion which is very comfortable for your pooch. It also has a durable nylon cover which is treated with a fabric protector. You can remove and wash the cover by hand. Do it in cool water and then line dry. The liner is also removable and machine washable on gentle cycle with cool water. This bed is waterproof, stain and odor resistant. You can only get this bed in two sizes, 42 X 28 inches and 36 X 23 inches. It is also only available in two colors – black and red. This bed is similar to some of the previous items on my list since it has a pretty ordinary pillow design. Now, this is a bed that has a unique style and stands out from the rest on my list. 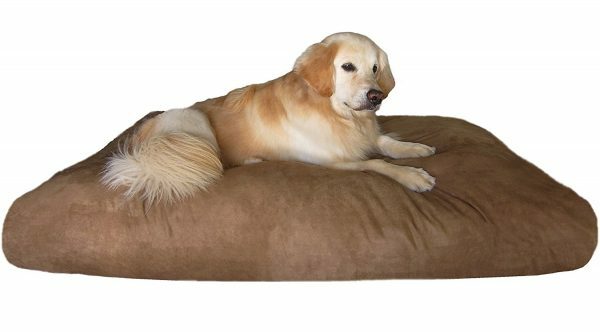 Snoozer Luxury Cozy Cave Pet Bed is a beautiful little thing that is sure to fit into any décor. However, it is also a great choice for outdoor use as well. I really dig this design, it is completely original and adorable. This bed is designed to provide comfort and warmth to your pooch. It has a poly/cotton exterior and a Sherpa interior. It also comes with a hood that provides a unique style and allows your pooch to nestle into it. You can get this bed in four different sizes and you also have an endless choice of patterns and colors. This bed is waterproof, as well as fade and mildew resistant. Of course it is also odor resistant thanks to cedar filling that controls the odors. The cover and liner are both removable and machine washable. It is important to note that some dogs might have a hard time getting used to this bed since the hood doesn’t stay up. If your pooch needs a lot of space, this bed might not be the best choice. Elevated dog beds are naturally resistant to odors, which is why they are a great choice if this is what you are after. They are also a great choice for summer days since they can provide a cooling effect that will keep your pooch comfortable in high temperatures. However, this is not enough to keep your pooch cool in the summer, so don’t rely just on that. Keep your pet cool with K&H Original Pet Cot . This bed comes with hammock design and you can use it both indoors and outdoors. Also, you can take it with you when if you decide to bring your pooch for travel since it is very lightweight, which is what I often do. It is a very strong bed that can hold over 150 pounds of weight. You can choose one of four sizes and three colors. This bed is made of water 600 Denier fabric which is water resistant. It comes with a mesh center that allows your pooch to stay cools due to its breathable quality. This bed comes with non-skid rubber feet that make sure that the bed always stay in place. You can clean this cot easily with a wet cloth. You can even hose it down if you like. Keep in mind that you will have to assemble this bed before you can use it. Even though this should be a quick process since it requires no tools, it can still pose a problem for some buyers. This elevated dog bed is extremely durable, so you won’t have to worry even if your pooch is aggressive with it and tries to chew on it. However, keep in mind that this bed can only support up to 100 lbs. of weight. Kuranda PVC Dog Bed is available in six different sizes and four different colors. Even though I am not really big on the style and design when it comes to elevated dog beds, I have to admit that this particular bed seems very stylish. This bed is a good choice for both indoor and outdoor use. In addition to keeping your pooch cool in hot temperatures, it is also a very comfortable bed. The Cordura fabric is resistant to abrasion and odor. It is also as durable as canvas and easy to clean. This bed also requires assembly. When i shop for a dog bed that needs to be assembled, I always read the instructions in advance to make sure that I don’t need any tools and that the process is not very complicated. This elevated bed is another great choice for high temperatures. It has a specific design that allows and increases air flow on each side of the bed. Thanks to its suspended platform, Gale Pacific Coolaroo Elevated Pet Bed offers a lot of comfort and support to your pooch. The bed is made of extremely breathable fabric which eliminates hot spots. The frame is very light but strong. It is powder-coated steel frame that can withstand a lot, regardless of your dog’s size. This bed is resistant to mites, mold, fleas and mildew. Of course, it is also resistant to odor due to its elevated design. You won’t have any problems maintaining and washing this bed as well. You can use this bed both indoors and outdoors. Since it is very lightweight, you can take it with you on a travel journey as well. You can get this bed in four different sizes and colors. It is also a very affordable product. This dog bed was designed with heavy chewers in mind. That is due to the aluminum frames and very sturdy and durable rips stoop ballistic fibers. K9 Ballistics Durable Chew Resistant Raised Dog Bed is one of the rare almost indestructible beds on the market. As other raised dog beds, this one is also suitable for both outdoor and indoor use. It is especially effective in summer since it can provide your pooch with the cooling he requires. This bed is waterproof and odor resistant. It is also dirt and hair resistant, and as we already mentioned, tear resistant. You can get this bed in 5 different sizes and colors, which means that you can find just the perfect style for you and size for your pooch. As style goes, I actually like the style of this bed a lot, especially the red version of it. You can easily clean this bed, a simple hosing will do the trick. One thing I hate about this bed, however, is the fact that assembling it can be hard for many people. At least it was for me. Finding a good, odor resistant dog bed on the market is not that easy, trust me. You simply can’t find a lot of truly odor resistant beds out there. Of course, you can and should try to find the best deal for you, but I really believe that my list can save you a lot of time and effort and I hope you like it and find it helpful. Of course, if you think I failed to mention some good odor resistant bed, share your idea with us in the comment section.